The TAR-500XL Scooter and Power Chair Carrier from Tilt-A-Ramp has a 400 pound weight capacity, allowing this lift to transport some of the larger mobility products on the market. It also has a 60" long ramp that folds in half when not in use and the ramp can be stored flat in the carrier when it is not carrying a scooter or power chair. It is a fully manual lift that requires no motors, batteries or actuators. 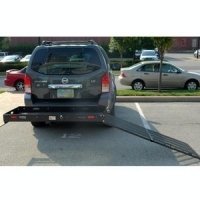 It has adjustment bolts for leveling and to prevent rattling and a spring-loaded locking pin that locks the ramp in place when it is folded vertically.